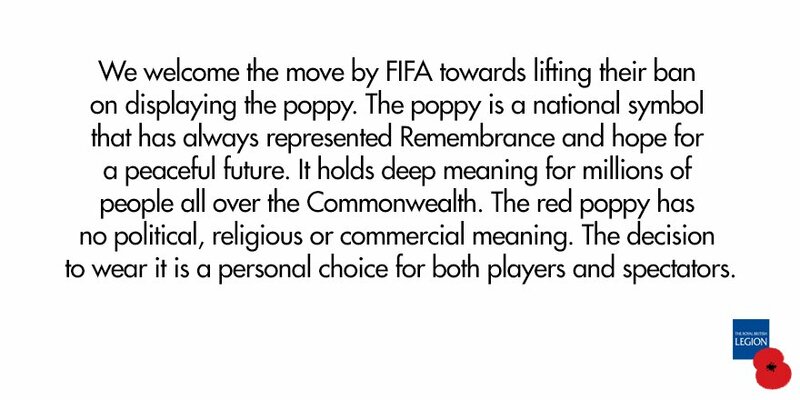 Finally, FIFA are set to lift their nonsensical ban on national sides displaying the poppy on their shirts or an armband. Last year, football's world governing body fined England, Scotland, Wales and Northern Ireland for their use of the poppy to commemorate Armistice day, deeming it to be a political symbol. Remains of soldiers from the First World War are still being found as the land is farmed, and construction works spring up. Here is some information about burials and rededication ceremonies are due to be held at CWGC cemeteries in September. A ceremonial burial will be held on Wednesday 6 September at 11am at CWGC Perth Cemetery (China Wall), Belgium, for an unknown First World War soldier of the Worcestershire Regiment. He was found in a field near Waterstraat in Zonnebeke, Belgium, with artefact of the Worcestershire Regiment. Despite research it has been impossible to identify him. The service is being organised by the Joint Casualty and Compassionate Centre (JCCC) and will be attended by Regimental representatives, local dignitaries and the general public. The CWGC will prepare the burial plot, provide the headstone and maintain the grave in perpetuity. A rededication service will be held on Wednesday 6 September at 2.30pm at the CWGC’s Zantvoorde British Cemetery, Belgium, for Serjeant James Joseph McLynn of the 4th Battalion North Staffordshire Regiment. His regiment was fighting near the village of Zantvoorde and due to their efforts managed to capture it. On 1 October 1918, they were at Ten Brielen (a neighbouring village) when they were heavily shelled resulting in several casualties, one of which was James. He was originally buried as an unknown soldier in Plot 4, Row K, Grave 24 but through research has now been identified. The service has been organised by the Joint Casualty and Compassionate Centre (JCCC) and will be attended by members of the regiment, local dignitaries, general public and his family. The CWGC will be providing the new headstone. A rededication service will be held on Wednesday 13 September at 11am at CWGC Arnhem Oosterbeek War Cemetery, Netherlands, for Lance Corporal William Loney, The Parachute Regiment A.A.C. L/Cpl Loney was killed on 17 September 1944 during intense fighting as part of Operation Market Garden, which was an allied operation that planned to land 30,000 British and American troops behind enemy lines to capture the eight bridges that spanned the network of canals and rivers on the Dutch/German border. Research submitted by the Royal Netherland Army’s Recovery & Identification Unit has led to William’s grave being identified after 72 years. The service has been organised by the Joint Casualty and Compassionate Centre (JCCC) and will be attended by members of the British and Dutch military, local dignitaries and the general public. The CWGC will be providing the new headstone. A ceremonial burial will be held on Thursday 28 September at 11am at the CWGC’s New Irish Farm Cemetery, Belgium, for 21 unidentified soldiers of the First World War, who served with various British Regiments. The soldiers were found following ground work at an industrial development at Briekestraat, Ypres, Belgium. The site is thought to be a war time cemetery, in all likelihood the original Irish Farm site, created by the Army under war conditions. It was believed at the time that all of the burials had been transferred to New Irish Farm, some 300 meters away. Through investigation it has been established that of the 21 British soldiers, four served with the Essex Regiment, two with the Royal Fusiliers, one with the Monmouthshire Regiment, one with the Argyll and Sutherland Highlanders, one with the Northumberland Regiment, one with the Royal Irish Regiment and 11 are “Known Unto God”. Unusually the ceremony will, therefore, involve the burial of casualties from English, Irish, Scottish and Welsh regiments. The service has been organised by the Joint Casualty and Compassionate Centre (JCCC) and will be attended by senior staff of the British Defence section, regimental representatives, local dignitaries and the general public. 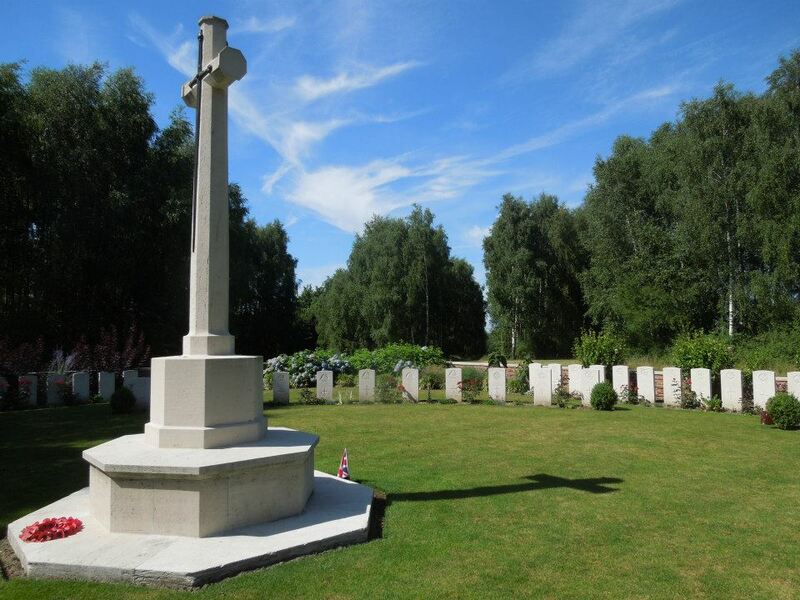 The CWGC will prepare the burial plots, provide the headstones and maintain the graves in perpetuity. Thank you to the Commonwealth War Graves Commission for all you continue to do to honour and respect our fallen heroes. Three years ago I was with a talented group of young people all volunteering for the Holocaust Educational Trust. We had travelled to Washington DC for a week of extra study and as our time in America drew to a close, our thoughts turned to the Holocaust Commission. This group of esteemed historians, personalities and politicians was preparing to write a report about how the United Kingdom could continue to teach the Holocaust and preserve the memory of those who suffered so terribly at the hands of National Socialism. Currently, there is a memorial in Hyde Park to victims, though I have no idea where. It is a lump of rock, no distinguishing features and easy to walk past. There is, of course, the excellent permanent exhibition at the Imperial War Museum, but this is where accessible Holocaust remembrance ends. The following year, the Prime Minister David Cameron announced what UK Government would do to ensure this period of history would never be forgotten. Sure enough, our recommendations (not solely our ideas, of course, many others had thought of these and written to the Commission) were publicly adopted. Amazing! The United Kingdom Holocaust Memorial Foundation has been created as a vehicle to move forward these projects. A piece of land has been found (Victoria Tower Gardens - next to Parliament), invitations to tender sent out and designs for the museum received. The final 10 designs are now being shown at the Victoria and Albert Museum. I went a couple of weeks ago to have a look at them. Firstly, I was delighted to see so many people at the exhibition. Most of them were probably foreign tourists visiting the museum as a whole, but anything that engages people in Holocaust history is good for me. You can view my favourite design here. The architects have also been kind enough to link back to the other designs. It's a beautiful design that stands out so as to be attractive to passers by, but not obviously at odds to the way the environment looks now. The issue being tackled here that other designs miss, is that we need to draw in visitors that might not necessarily have a trip to a Holocaust musuem in mind. The above ground structure is beautiful, but not invasive on the eye or indeed the environment. The design brings a combination of light and darkness, reflecting the many components of Holocaust history and of course, the way one feels when listening to survivors and exploring the subject. What worries me about this project as a whole, is the dreaded planning permission! Local people are not at all keen to rip up part of the public gardens. It has nothing to do with the subject matter, but everything to do with access to this green space. Visually and practically, I feel this design keeps the open sense to the gardens and, I think it has a better chance of getting planning permission from Westminster City Council. Today marks 100 years since Staff Nurse Nellie Spindler died during the Third Battle of Ypres. Here is more about the heroic nurse who is the only woman among more than 10,000 men in the CWGC’s second largest cemetery in Belgium. One of only two female casualties of the Great War buried in Belgium. Nellie Spindler was born in Wakefield, Yorkshire, in September 1891, to George and Elizabeth. George was a Sergeant, and later Inspector in the local police force. Nellie was the oldest of two daughters born to the Spindlers. Nellie entered the nursing profession before the war. In 1911, she was a hospital nurse at the City Fever Hospital, Wakefield, and later transferred to the Township Infantry in Leeds and then Whittington Military Hospital in Litchfield. Nellie joined the Queen Alexandra’s Imperial Military Nursing Service and in May 1917, travelled to France. Here Nellie was initially stationed at the Stationary Hospital in Abbeville, before being transferred to No. 44 Casualty Clearing Station (CCS) which in July 1917 moved to Brandhoek, Belgium. No.44 CCS specialised in abdominal, chest and thigh wounds which needed urgent treatment and so was stationed relatively close to the frontlines. Though around five miles from the frontlines, Brandhoek was within range of the larger German guns, and with its railway sidings and munitions dumps was the target of frequent German shelling. On 21 August 1917, the hospital was shelled all day and at 11:00 Nellie was hit along with four other nurses by an exploding shell. Struck in the back or chest (the accounts differ), Nellie soon became unconscious as the hospital staff desperately tried to staunch her wounds but to no avail. Nellie died just 20 minutes later in the arms of a fellow nurse. One of Nellie’s colleagues, Sister Kate Luard, gave an account of the incident in a letter home. "I’m afraid you’ll be very disappointed, but we are to re-open on the same spot so Leave is off. I expected [for one rash day] to be telling you all about Tuesday at home tomorrow, but must write it now.